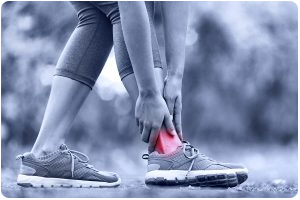 If have recently experienced a foot or ankle sprain, you should schedule an appointment with one of our foot doctors in Wayne, NJ, or one of our foot doctors in West Milford, NJ, today! Sprains are typically painful, and if left untreated, can cause other foot conditions as you adjust your gait while walking to avoid pain. Adjusting your gait in this way will cause stress on the bones, ligaments, and muscles, which can lead to bunions, hammertoes, corns, calluses, and more! Come and experience Wayne Foot & Ankle and you will see we offer the very best of podiatry care to patients in and around Wayne, Hewitt, Paterson, Haledon, North Haledon, Pompton Plains, Oakland, Woodland Park, Totowa, Pompton Lakes, Kinnelon and West Milford, New Jersey (NJ) suffering from a foot sprain or ankle sprain. If you think you may have sprained your foot or ankle, call us at (973) 595-8900 to get relief now!